The Deer Hunter is one of the most brilliant American films from the second half of the 20th century, and one of the most memorable and tense scenes you will ever come across is the Russian Roulette sequence in the Viet Cong prison camp where John Savage, Robert De Niro, and Christopher Walken are all staring down the business end of a loaded gun. Among the group of unknown local actors is one insistent member of the Viet Cong who keeps screaming “Mao!” at the men in order to get them to pull the trigger faster. He’s simultaneously irritating and terrifying as the game wears on. 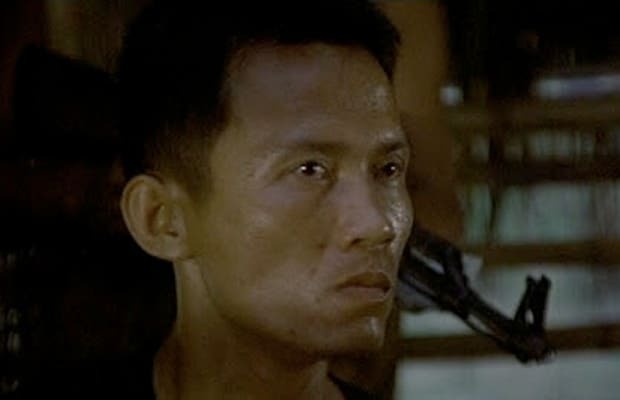 Not even an accomplished actor, Ding Santos made the entire film with this menacing role.